MANILA, Philippines -The government's Official Gazette has earned the ire of netizens after sharing a photo of late strongman Ferdinand Marcos on its Facebook page amid oppositions to his upcoming hero’s burial at the Libingan ng mga Bayani this month. The photo’s controversial caption was edited several times, taken down and re-uploaded after netizens criticized the Philippine government’s communication channel of “historical revisionism” and downplaying the atrocities brought about by the Marcos regime. The photo of the former dictator, which featured a quote from Marcos’ inaugural address on December 30, 1965, was meant to be a tribute for his 99th birth anniversary. However, it was the lengthy caption on the post that angered social media users. "In 1972, he declared Martial Law to suppress a communist insurgency and secessionism in Mindanao. 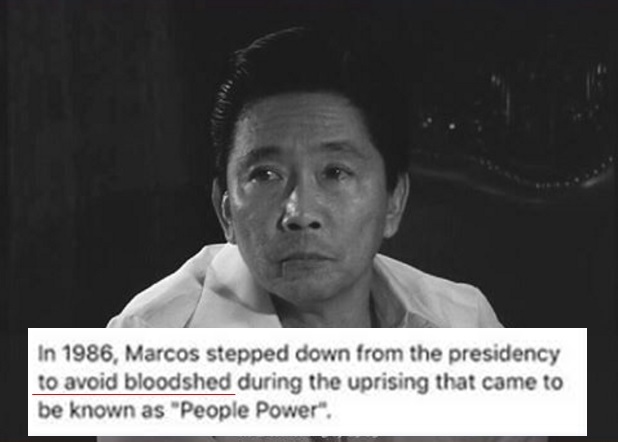 In 1986, Marcos stepped down from the presidency to avoid bloodshed during the uprising that came to be known as 'People Power,” the last portion of the caption read. Still, the post continued to receive bad remarks from netizens who alleged the government of setting aside the human rights abuses, ill-gotten wealth and sufferings of Filipinos during Martial Law. Because of this, the Official Gazette deleted the photo. But the edited post was once again met by disapproval. “The caption should have been ‘Ferdinand Marcos stole $10 billion dollars worth from Filipinos, had 34,000 Filipinos tortured, had 3,240 Filipinos murdered, and was so hungry for power he tried to stay dictator for life.’ That uses less words,” a certain Raymond Rodis commented. This prompted the Official Gazette to revise caption for the last time on Monday, September 12. The post now includes details about the Martial Law and Marcos’ exile in the US. 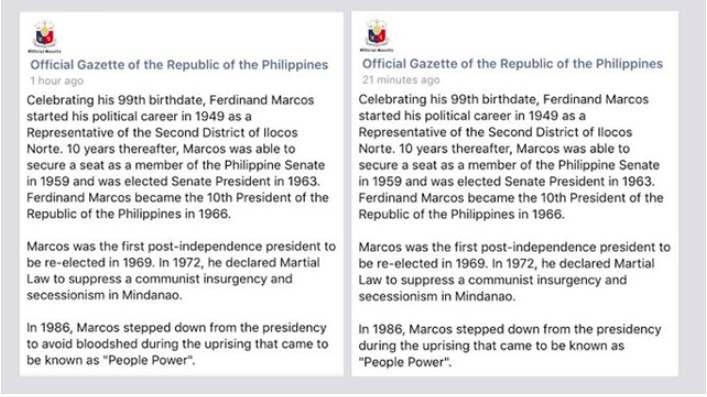 It also mentioned that Marcos was succeeded by late President Corazon Aquino. Despite criticisms, Presidential Communications Office (PCO) Assistant Secretary Ramon Cualoping III stressed that the Official Gazette didn’t commit historical revisionism and pointed out that they are merely conveying “what is documented in the official records."